Divis Accordion Module is really nice if you quickly need to add an Accordion to your site but it is very limited in functionality and designability. Accordion for Divi is a replacement for the default Divi Accordion with a lot of extra functions. The module is completely stylable via the module settings and has CSS fields for every element. But not only that, instead of creating content ad-hoc inside the module, Accordion for Divi adds a new Post Type to your WordPress (similar to the Projects Post Type). You can categorize your Accordion Items and select the categories you want to use inside the module. 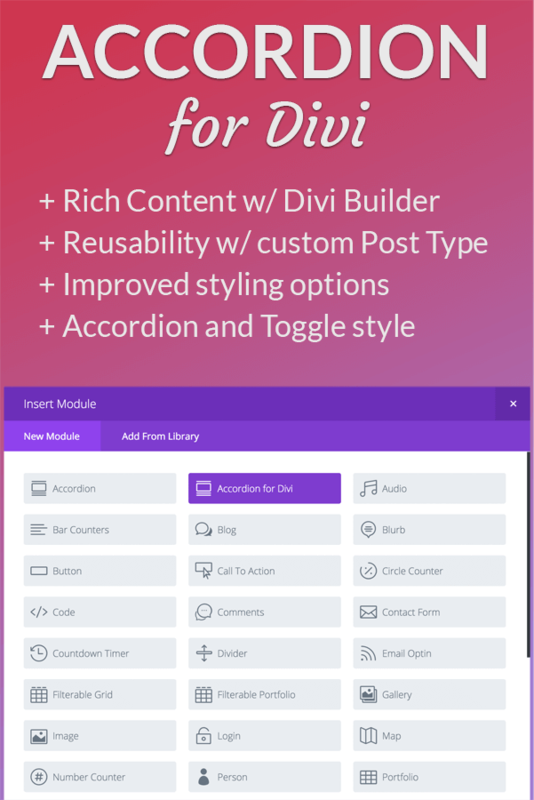 This lets you use the Divi Builder to create the content of an Accordion Item. Besides that, Accordion for Divi comes with the option to use it as toggles, meaning that you are now no longer forced to have the first toggle open and one toggle open at any time. This looks a lot cleaner and is perfect if you want to create FAQs or other kind of Accordions. Check out the demo and documentation for more information and to see some examples of what you can do. Please have a look at the documentation to find out how to use Accordion for Divi. Accordion for Divi is a WordPress plugin. Download the zip file and install it in WordPress Plugin section like any other plugin. There is no need to unzip the file. Once installed, updates can be automatically installed via WordPress without the need to delete and install the new version again. If you have questions, need help or found a bug, use the contact form on the demo page.